Why Mars? Why not the moon? Just curious, Elon wants to colonize Mars, Why Mars, why not the moon? It’s a lot closer, practically a hop, skip and a jump compared to Mars. I’m sure there must be reasons why Mars and not the Moon, anyone know why? I believe there are more new discoveries to be made on mars than the moon. Most scientific evidence points to the moon literally being a spin off of the same material as earth. So more of the same. While the distance to mars is no small feat, neither is its size relative to our moon. There is a significantly higher probability to make profound scientific discoveries (minerals or fossils, evidence of life past or present) on mars than on the moon. If you want to watch a fun show, look for MARS on prime which gives some insight into why MARS with a science fictional twist. @David N: there’s a REMOTELY TINY chance of terraforming Mars...the moon, not so much. Also, if we’re going to become a multi planetary species, we need to solve long-distance space travel and high-G rocket landings through atmosphere. I believe part of the reason is gravity or the lack of it on the moon. Mars has gravity though not one for one with earth but there is gravity which would make it easier for us to adapt to. Also no source of water on the moon. Besides, the moon is so 1960's.............. :-). Mars has an atmosphere making it far more likely to be habitable. One can extract oxygen from its CO2 atmosphere. There is evidence of water on the moon at the poles. As others have already commented, Mars offers far grater potential than the Moon does, plus, the engineering advances involved in overcoming the various obstacles required to obtain interplanetary travel will provide multifaceted benefits for decades, even centuries, to come. This is not to say that there isn't any likelihood that we'll eventually set up some sort of installation on the Moon, say, a manufacturing and scientific research facility liken to that portrayed in that '70's British-Italian scifi show, "Space:1999", i.e., "Moonbase Alpha" perhaps, and have transport vessels like those nifty (did he really just say 'nifty'?!) "Eagle" sub-light speed capable spacecraft that are capable of nearby &/or neighboring interplanetary travel, but Mars presents the most potential for economic and intellectual growth as well as Human advancement and expansion. Yes, but you'd have an excellent view of the explosion when he finally snaps. There is water on the Moon but no carbon. MIght be able to grow potatoes on Mars but don't forget the ketchup. Liquid water cannot last on the Moon's surface while any water vapor is readily evaporated by the sunlight that strikes it. This is because daytime on one side of the moon lasts about 13 and a half days, causing the Moon's surface to reach temperatures up to 260 degrees Fahrenheit (127 degrees Celsius), followed by 13 and a half nights of darkness, causing surface temperatures to plunge to minus 280 F (minus 173 C)! So you're a crispy critter or an icicle or something that fluctuates between the two over the course of 13 and a half days, so I guess something along the lines of stale beef jerky. However, based on our own Earth-bound observations, it is speculated that water in the form of ice could potentially survive in the cold, permanently shadowed craters at the Moon's poles, say, if it was once a component of an asteroid or meteor that happened to have smashed into the lunar surface inasmuch as none could ever form of its own accord due to the lack of an atmosphere. In otherwords, the Moon is a very desolate place that would only be habitable through the application of extensive engineering and redundant, precautionary measures. Yeah but you keep driving your solar powered RV in the Goldilocks zone. I hear it’s constanctly at 72 F there. Plus, one arm from the RV could extend into the hot zone to bake your Pizza. The other, to freeze your Ice Cream. Best of both zones. Only time will tell not to mention there's still the need for the consideration of some sort of shielding to protect colonists (and all Space travelers too) from exposure to the unending radiation that exists in Space/on non-atmospheric planets given that there's no atmosphere on the Moon like we have here on the Earth to keep us from being cooked from the inside out like in a microwave. Time, Innovation, Courage, and Curiosity...All great motivators. Hence Mars because the Moon is simply too inhospitable of a place to establish anything other than, maybe, an off world processing and refinement installation for mining of the asteroid belts encircling our Solar System, the Main Asteroid Belt and the farther outlying Kuiper Belt to, perhaps, produce ever larger deep space craft capable of taking us farther into the depths of Space. although it's likely much more prevalant on Mars. Moon dust is some pretty nasty stuff - with no wind to blow the dust and sand around and smooth it off like Earth sand, it's basically tiny shards of sharp, shattered glass. Having any kind of long-term habitat is going to require figuring out air filtering mechanisms to keep human lungs happy, and lots of maintenance on mechanical seals (air, oil, etc) to replace them as they get shredded. Mars sand/dust, on the other hand is going to be a lot closer to Earth dust. The Moon is a dead world. Mars is...interesting. There are seasonal change, perhaps water seeps, and other things that occur that make for a broader range of things to explore. Evidence of life is far more likely on Mars, which now appears to have had lakes, rivers, etc of liquid water in it's early history. Mars is far enough away from Earth that it forces us to face those life-and-death issues that we have to figure out how to handle - an Astronaut on the Moon with a life-threatening illness can be transported back to Earth quickly. Not so much for an Astronaut on Mars. Astronauts are more likely to become socially dysfunctional on the way to Mars - do Mars ships need a jail? The moon is easier partially because it's closer, but mainly because we don't have to face these issues. [Apologies to paraphrasing Kennedy's speech on the Subject from 1962]. but it is as succinct a summary of "why" today as it was when Kennedy said it. "We choose to go to Mars in the next decade and do the other things. Because that challenge is one that we are willing to accept, one we are unwilling to postpone, and one we intend to win." Musk's vision is to build rockets, so he can fly enough people to Mars to save Earth, and for himself, to die on Mars - one day. Make enough money so he can live forever on Earth. No matter how many blood transfusions it takes, or how uninhabitable a planet Earth becomes. He likely then hopes he can wave a lot of Money at Musk to escape to Mars when its safer to do so than remain on Earth. Which of these competing visions wins, you'd have to accept that Musk's one generally provides a lifeboat option for Humankind. Thiels vision provides at best, a lifeboat, for a man. A Roadster is already on its way to Mars for fun. The new Roadsters may use rocket technology for maneuverability. What people don't realize is that new products come out of new endeavors like Velcro from early space attempts. Musk has access to these discoveries and the interuses of new products from SpaceX, Boring, GFs, Semis, PV tiles and who knows what else that is yet to come. I believe Musk employs 50,000 people all of superior experience and accomplishments. I wish Musk whee running our country. Musk has made California Great Again. >>> "Astronauts are more likely to become socially dysfunctional on the way to Mars - do Mars ships need a jail?" That's an...interesting assumption you've made. Whatever makes you think that, of the plethora of potential difficulties astronauts making the 6 to 7 month trip to Mars might have to face and overcome, "social dysfunction" would be one of them? Personally, I don't see it so much as a "lifeboat" option than as a necessarily unavoidable exploratory investigation of the surrounding planets of our Solar System to, among other things, allow us to gauge the diversity of potentially habitable environments we're likely to encounter once we manage to make our way beyond our own Solar System. While there is all so much more out there in the vast reaches of our own galaxy, the Milky Way is but one of numerous galaxies scattered all across the Universe, each containing thousands, even millions of other planets and each, potentially, with their own versions of life/cultures/civilizations, hence another bit of motivation for developing interplanetary capable spaceflight (as it would be a stepping stone towards deep space exploration). Doing any of those things require that we as a species still be alive in the future to do that exploring (or invent machines to do it for us). And of course be sufficiently technologically capable of building rockets and such to leave Planet Earth behind. And those plans will require lots and lots of time to develop the technology to get us even beyond our Solar System. 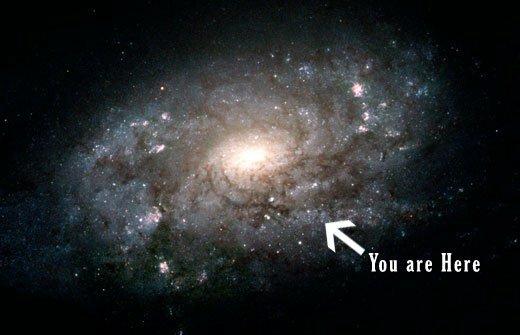 Let alone the rest of our Galaxy, Local Cluster, or beyond. As it stands we likely won't make it much past the next 100 years in terms of being in a state to be outward looking enough to want or be able to go to Mars, let alone beyond. Hence Musk's lifeboat plan - at least if we don't leave all our eggs on Planet Earth we have a Plan B ready. But its but small baby steps on a very long journey. That we even feel it necessary to make preparations to leave this planet in order to preserve our species is, to me, more than enough reason for us to focus our efforts on doing what we can to both mitigate the impact we've had on this planet and put our efforts into cleaning up the environment to prolong our livelihood here. Not to mention that we've found ourselves in a position to have to consider a 'Plan B' is testimony of our failure as a species and casts serious doubt on our ability to do any better anywhere else due to our demonstrated potential of falling prey to the very same detrimental influences that have us in the position we are now. 8B and counting. Probably as little as 1% of those have the acumen to preserve our way of life. Rest are irresponsible and/or unintelligent. Nature (human, not the other one) will see to it that we balance this situation out. As Reese says in ‘The Terminator’ - it’s in our nature to destroy ourselves. There’s also a theory about why no aliens have contacted us. Intelligent life forms ultimately destroy themselves. Just a theory, but makes you think a bit. Non interference with Alien civilizations is a directive(Star Trek). Let them evolve. The dumb die while the smartest will survive and flourish. By definition, intelligent life is not self destructive. homo sapiens may not be as intelligent as other forms in the universe. If intelligence from another part of the Universe were to contact us they already realize how primitive and warlike our species is so they may not want to upset us. Notice how anything Alien is assumed to be a threat even if the Alien is helpful. My random thoughts this Sunday. Which, in the grand scheme of things, isn't much of a cause for concern since our population fluctuates cyclically with the preceding generations dying off to make room for the emerging generations roughly every 50 years and, since we're throwing away 40% of our edible foodstuffs every day, we've still a surplus available to us if things got tight, which they won't because of the whole cyclical birth cycle and generational replenishment I mentioned. THAT'S the problem we need be concerned with. "As the right of each sentient species to live in accordance with its normal cultural evolution is considered sacred, no Starfleet personnel, Federation citizen and/or representative may interfere with the normal and healthy development of alien life and culture. Starfleet personnel may not violate this Prime Directive, even to save their lives and/or their ship/installation, unless they are acting to right an earlier violation or an accidental contamination of said culture. This directive takes precedence over any and all other considerations, and carries with it the highest moral obligation." "Nature" could take us out, e.g., "The Day After Tomorrow", or we could take ourselves out (which it is looking like more and more everyday) by polluting the environment to such a degree that it is unable to sustain us, be it through our prohibiting its natural ability to cleanse itself of our excesses, or through our poisoning of it to such a degree that it, in turn, poisons us via the foodstuffs we've grown, caught, or harvested from it. Either way we've only ourselves to blame if we sit idly by and do nothing to prevent our demise when it is, clearly, well within our ability to remedy the situation. @blue adept Thanks for detail of the Prime Directive. Excellent policy. If my memory serves me correctly Rome died from Lead poisoning from drinking it via their delivery system. It appears the EPA is doing similar actions such as letting mercury be released by burning coal and allowing contamination of our water with residues from industry besides the Global Disruption from burning fossil fuels. This could be called evil. Actually the lead and mercury causes neurological damages making people CRAZY. Could that be why such poor government decisions are made? One example I recall is a coal roller guy who actually put his dumb face in the exhaust and breathed it which is pretty crazy. The people at the fed level seem very unhappy and very self destructive display a masochistic/sadistic mentality. The Russian fossil fuel industry trolls may have thrown the elections from what I've read. Hope America can survive this debacle. And this is interesting how easily Russians are controlled by its government; keep the populace on alcohol/drugs and you have control. I hope America is more sober but not so sure. "Perhaps it explains the president we have elected"
More likely it explains the voters who elected him. FWIW, oil is Russia's primary source of income, exclusively, ergo, the only thing required to destabilize Russia's economy and bring it crashing down is to stop importing oil from Russia, effectively neutering the country. Yes, an excellent, ethical and logical policy. >>> "It appears the EPA is doing similar actions such as letting mercury be released by burning coal and allowing contamination of our water with residues from industry besides the Global Disruption from burning fossil fuels. This could be called evil." >>> "Actually the lead and mercury causes neurological damages making people CRAZY. Could that be why such poor government decisions are made?" Possibly...We'd have to examine their diets and check for any neurological degradation to determine for sure. Lead tests. Remedy is to remove the environmental sources. But what does this have to do with Mars? Crazy humans destroying Planet earth makes a Mars trip needed to keep the species alive. Why humans self destruct which may be due to environmental pollution that makes them crazy. The Mad Hatter used mercury for hat making which made them crazy. Ah, but it isn't just the mercury...Companies are dumping a helluva lot more than mercury into our environment and doing it all in the name of Capitalism/Profit that is sold to us as necessity for economic security when all it's doing is fattening their bank accounts while the little guy gets paid a pittance to make ends meet, support their families and get by in Life. Mars is said to be a planet and scientifically proved that people can able to sustain their life in Mars. This is the reason to go ahead with Mars. I think that the thing that irks me most about the dire global situation we're finding ourselves in due to a handful of individual's greed is that they could fix it (we have the technology) while still generating profit, but they would rather jeopardize their own lives and those of their own children, and everyone else along with them, solely for the sake of satisfying their own greediness. Talk about heinous indifference and unchecked selfishness! The rationale for such rampant avarice is just unfathomable to me. It's truly bewildering. blue adept. It is incredibly stupid since they don't even know what to do with the enormous amount of money they already have. This could simply be an addiction like gambling or drinking. I did see a documentary on a Koch brother buying wines for tens of thousands of dollars per bottle. They got ripped off by a guy who relabled the wine in his apartment and sent the money back to his family I believe. I forget where I saw this but it gives an insight into the desires of these people. The problem is that the people who control and profit from the oil are not the ones who can fix or profit from the problem. If all you know how to do is drill, pump, and refine, (and you've gotten filthy rich because of it) everything looks like a well.